Featuring paintings of real Oregon life and nature, miniature and large impressions in oil, pastels, watercolor and acrylics. You may also wish to visit the permanent collection at PainterofOregon.com. This 9" x 12" watercolor painting started out as a wave study and I just ended up turning it into a painting. It was an accident, I swear. So here is the weird part; since I was just doing a watercolor experiment, I grabbed the paper that was closest to me; Bienfang Canvasette. It's a 182 lb paper-impregnated canvas - usually used for oils or acrylics. Canvasette makes the painting look different. It has lots of texture, for instance. And for all I know it will easily last for the next 500 or a thousand years but I can't be completely sure. So I've decided to have a contest and give this painting away to some lucky person or sentient being. Friend me on Facebook (see sidebar for a link) then tell me your facebook name in the comments below. Follow me on Twitter and give your Twitter @ handle in the comments below. As with Facebook, you'll find a link to my Twitter in the sidebar of this site. Follow this blog using the Google Friend Connect panel in the sidebar, and mention your Google ID/name below. There must be a minimum of 10 entries in order to have this giveaway, otherwise it seems silly. I mean, if fewer than 10 people care, why bother, right? So tell your friends! The more the merrier. Not open to family members, sorry. You guys already get freebies from time to time. Contest ends on April 15, 2011 at 5 PM Pacific US time. Shortly thereafter, if we've had at least 10 separate people entering for this painting, I'll have a third party draw a name from a bowl and I will attempt to notify the winner. If I don't hear from you by the following Monday, I will have my third party draw a second name. One way or another, this painting is going to a new home! It is an experimental work, as I said. It's kind of a weird surface for watercolor - but it still could have some value someday. So lets see some comments/friends/followers whatever, k? And as I said, tell your friends. I think I'm supposed to add 'no purchase necessary and void where prohibited by law' so there you go. 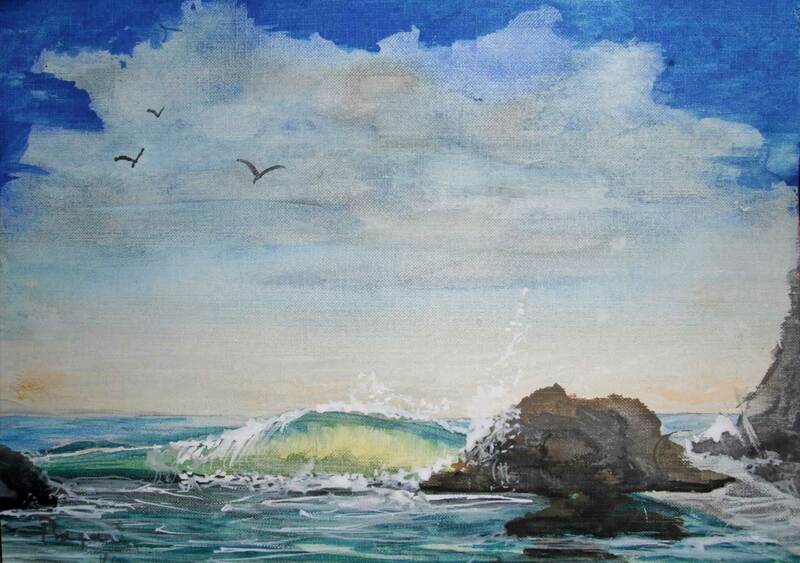 I'm reading: Wave Study / Oceanside Watercolor - GIVEAWAYTweet this! I have just run out of watercolor paper and do not know when I can buy any more so have been thinking about using my acrylic paper! How funny to run across this! This painting draws me into it. I can easily imagine myself standing on the rock with a light jacket on looking out over the water lost in thought. I think you know where to find me! I will tweet about this often! The are many painting styles of the seaside and waves that as a waterperson just make me cringe. Yeah, some artistic license may be involved, but this somehow connects more to my memories of the place I grew up and miss quite often as I am half the world away. I tried to come back and survive but found it hard to make ends meet with the economy so lousy, so left again for greener shores. Only had a brief connect with the memories. Still miss home. Nice job with this. I'm following you through google friend here as petsjubilee and i also sent a request to friend you on facebook - my name there is ciao hound. OMG what a beautiful Northwestern ocean scene! How blessed you are to have such a wonderful talent. I love the way you made the light show through the wave. You have a very familiar face, have you ever lived in Texas? I have friended you on FB. My name is Tammy W.
This is a beautiful painting. I just love it. I live near the beach, and there is nothing like going down to the boardwalk, and watching the waves crashing against the rocks, and the birds overhead - exactly the scene you have painted. I love it. You are very talented. I wish I could paint. It looks so relaxing. I am following you on google - under the name DianaDesign4Dogs. Your painting turned out absolutely beautifully. Good luck to all who enter the contest - whoever wins this is a very lucky person indeed! Chris, Your painting is gorgeous. I love the colors and the movement of the waves. You are so talented. I've lived on the east coast my whole life, and I'm a huge beach lover. Your painting is so beautiful and unique; I hope someday I get to visit the west coast! My name is Sarah G., and I just sent you a friend request on facebook. I have always followed you and all your cats from the good to the sad and love that you take care of them all,this painting is beautiful and i would love to win this for my beach room-since we dont live on the beach one room in my home is my dream beach room and your painting would make it so perfect! Beautiful painting! I love the texture and the colors! Thank you for the work you do with feral cats, you are an angel. I'm not entering but i wanted to send you my best, Chriss. Keep up the good work with the kitties ! I'm following this blog. The ID is JLynnPro. My name is Jennifer Moore. Beautiful art! Thank you for taking care of the cats. OK Done everything! Tweeted about the giveaway, joined you of FB and Twitter. I love this picture - Even if I don't win it's a privilege to see such wonderful inspiration at work. The best works often start as "accidents" don't they? :) I love this piece. Following on Twitter as @MewfaceTuna. Take care! Positive and/or helpful comments are always appreciated! Chriss Pagani/Painter of Oregon art. All rights reserved. Powered by Blogger.